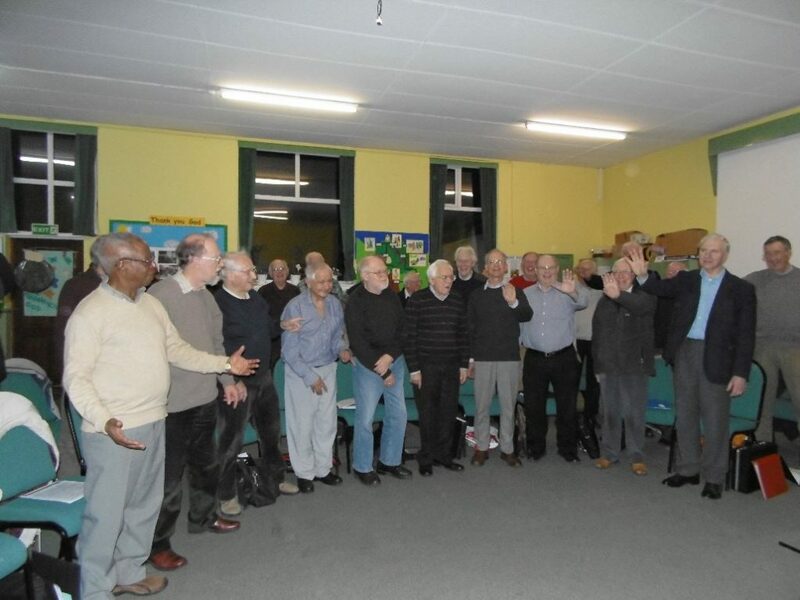 The Choir was set-up as a “Singing for Pleasure” group in 1994 by Tony Moore, a community worker at Waltham Abbey Community Centre, Essex. 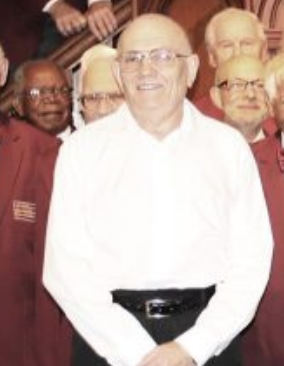 Tony is now retired & is still the Choir’s Public Concerts Manager. In 1998 we received a grant from the Millennium Lottery Fund towards equipment and uniforms that enabled us to entertain the elderly in day-centres and residential homes in the area. The repertoire is varied and very easy on the ear! We mainly sing popular songs, songs from the shows, a little bit of church music and popular opera, written between the start of the last century right up to this year! We are affiliated to the National Association of Choirs and Making Music. 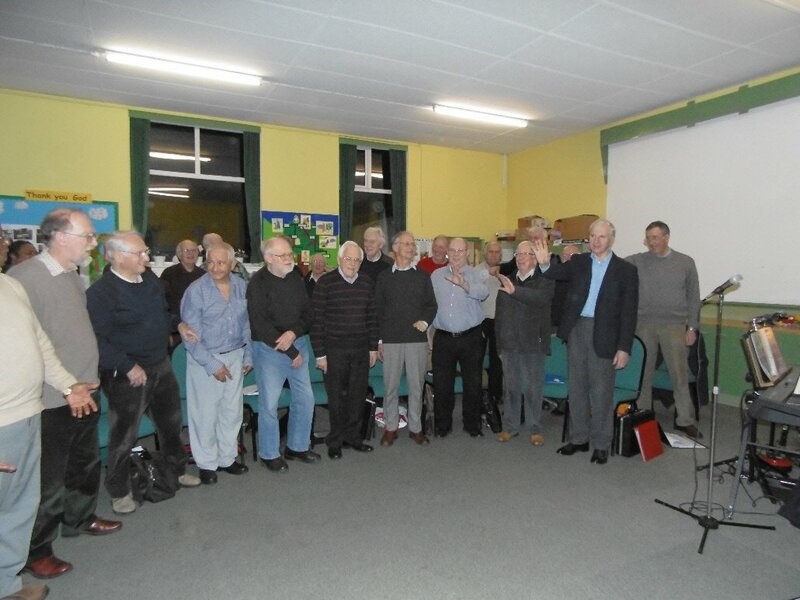 Our Musical Director, Virginia Firnberg, joined the Choir in October 2014. She studied piano and composition at the London College of Music gaining an LLCM in 1985; and an MA in Piano and Composition from Michigan State University (USA) in 1994. Virginia has always had a strong interest in vocal work, having written many pieces for the voice and accompanying singers on the piano to earn her living throughout both degrees. As a choral director Virginia led the Hackney Community Singers 1 & 2 from 2002-5 and was arranger and sometime musical-director for Ekhoz A cappella group. She has also founded (with Jo Clare) and directs a local mixed choir, ‘Walthamstow All Voice Ensemble’ (WAVE). In addition to her musical accomplishments, Virginia is a poet! Her poetry has appeared in many publications including: FLOATING CAPITAL, an anthology of new poets from London (Potes and Poets Press). 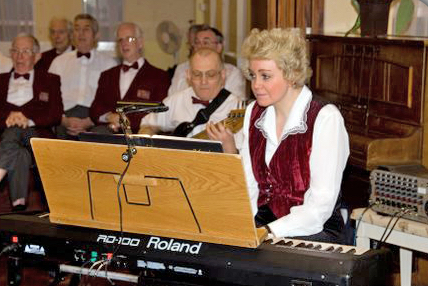 Accompanist Jane Kenton has been with the Choir since 1999. 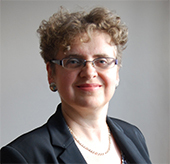 She gained an ALCM in piano from London College of Music in 1988 and is also piano accompanist for ‘Broxbourne U3A Choir’, ‘Lea Valley U3A Choir’, and the ‘Evening Chorus Choir’. She teaches the piano to children and adults and plays the church organ for Sunday services in Chingford. In the 1990s she played the piano accordion as a member of ‘Fairkytes Accordion Band’ in Hornchurch. Dave Pearson accompanies the Choir with his Bass Guitar, adding an extra dimension to our music. Whilst studying at the Royal Academy of Music, Roland won the prestigious Julian Bream Prize in a competition that was adjudicated by the world renowned guitarist himself. After his studies Roland quickly established himself as a leading player in guitar ensemble and chamber music leading the English Guitar Quartet and the Segovia Trio. His latest guitar group, which was established in 2001, is the Modern Guitar Trio which exclusively performs the works of the three players. Apart from giving recitals all over Britain and several countries in Europe, Roland has toured Canada, Australia, Israel and Venezuela. He has appeared on radio and TV and recorded Rodrigo’s Concierto de Aranjuez with the London Philharmonic Orchestra. He has worked regularly with the Royal Ballet and appeared on stage with them at the Royal Opera House, on tour and on film. In 1992 Roland was appointed professor of Guitar at Trinity College of Music (now called Trinity-Laban). Well known as an arranger of music that features the guitar, Roland has produced over 300 arrangements and transcriptions. 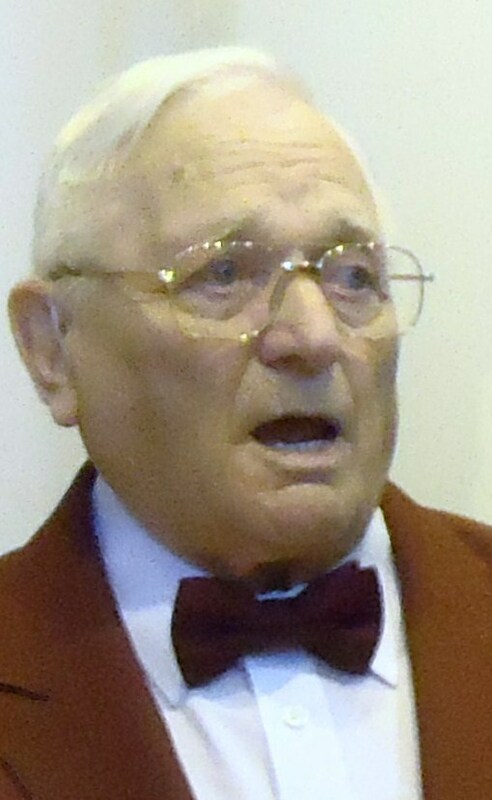 Many composers have written works for him and he also works with contemporary composers, such as Michael Berkeley, in the preparation of new works and as an expert in music notation software. In addition to her work in the UK, she has performed in Holland, Germany and Switzerland and has worked with several orchestras, appearing in London’s major concert venues and featuring in broadcasts for BBC Radio 3. She has given performances of the Mozart Flute Concerto in G and Concerto for Flute & Harp, the Cimarosa Concerto for two flutes and Bach’s Brandenburg Concerto No.5. One of the conductors she has worked with is Sir Simon Rattle OM CBE. Throughout her career, Alicia has worked in duos with both piano and guitar, performing numerous recitals for music clubs and societies. 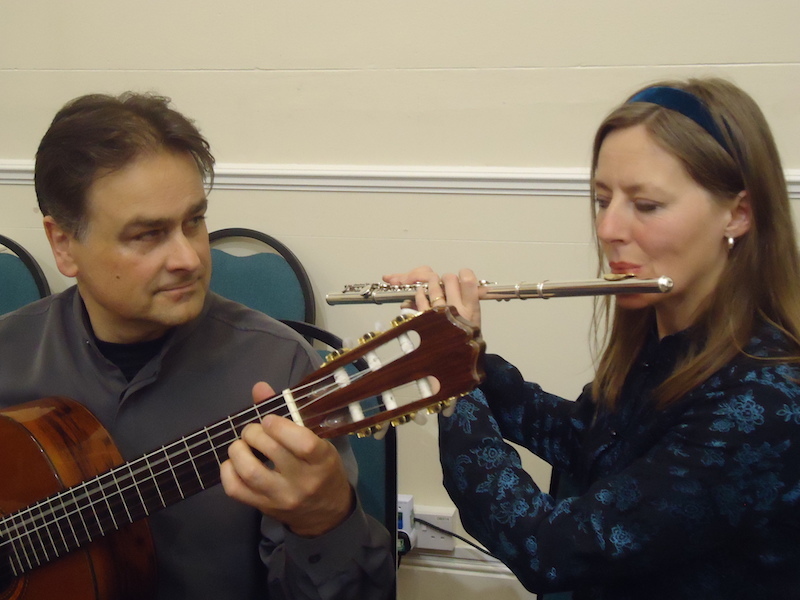 Having a special interest in flute and guitar, she is actively involved in projects working with contemporary composers in order to develop and extend the repertoire. As founder member of a musical story group with piano and narrator, Alicia composes and arranges classical scores with stories to perform to children, in order to illustrate the emotional content of classical music and to cultivate interest from a young age. Alicia is also an accomplished pianist and as an amateur enthusiast plays violin, Celtic harp, guitar and mandolin for which she enjoys writing music in folk, Celtic and classical idioms.